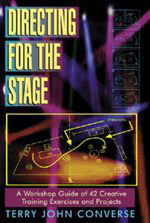 Appropriate for both beginning and advanced courses in directing, this is the only theatre text that combines theory with active student participation. The 42 exercises detailed here provide both the instructor and the student with a ”user-friendly” workshop structure. With the basic concepts of directing presented progressively, the approach is totally hands-on. The student discovers the demands and problems of directing by actually doing it step-by-step, and through the process, his or her own directing style emerges. Every exercise is presented in great detail and includes both an overview and a section on how to critique a student’s work whether you’re the director or a classmate. Read more...Creativity and confidence building are the central benefits of this excellent workshop text that includes seven sequential chapters: Creating the Directing Workshop, The Silent Seven, Justifying Movement, Ground Plan Exercises, Open Scene Exercises, Closed Scene Exercises, and Supporting Parts. An inspirational and informative approach to directing that will serve as a lifelong career reference.